Water Therapy is exercise that is performed in the water with decreased weight bearing through the body that nearly eliminates gravity. You do not need to know how to swim or even own a bathing suit to benefit from AT; shorts and a t-shirt or tank top are acceptable. The exercises are performed under the supervision of a licensed Physical Therapist or Physical Therapist Assistant. The buoyancy of the water takes away a percentage of your body weight and allows the natural traction of the joints to facilitate in decreasing the effects of gravity by 50%, allowing for less pain and tension on the body. The water also relaxes the muscles and tendons, giving you more mobility. The water’s resistance is distributed equally throughout the body, giving you a total body workout – including balance and coordination. If you are looking for a more intense, care based workout you can also perform Burdenko water exercises. Burdenko is an exercise program performed in shallow or deep water with flotation devices. This allows for more weightlessness and traction, especially of the spine. 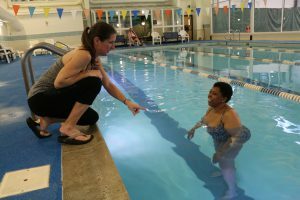 The exercises are still performed against the water’s resistance and work on strengthening core musculature, body control, and awareness in the water. Again, you do not need to know how to “swim”, however, feeling comfortable in the water is preferred. You may speak with our Aquatic Therapist for further information or visit our website, here.